Many industries rely on timesheets to monitor employee productivity and calculate earnings and benefits. 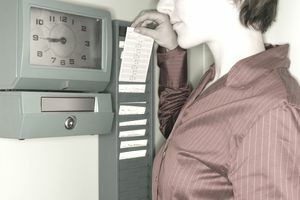 Some use a "clocking in" system with official timecards, and others rely on a time management system that records intricate details about the way the time was spent each day. The latter is the one used by advertising, marketing, and design agencies around the world. The data input on these timesheets, usually by the staff in the creative department, logs the hours that have been spent on every part of the project. That doesn't just mean the creation of the campaign, but the initial briefing, the client presentation, and even the time spent at the shoots and production studios. Only by getting a clear picture of the way the time has been spent can an agency effectively handle the workload, the client billing arrangement, and the way the time is allocated between teams. When starting a project for a client, the account manager or traffic manager will open a job number and begin to track hours. These will usually match the proposal or bid given to the client, and will be broken down into hours spent primarily in research, planning and strategy, creative development, production and project administration. If all goes to plan, the actual hours spent on the project will correlate nicely with the estimate, but that usually isn't the case. Creative development often eats up more time than any other part of the process, due to a change in direction, client feedback, or the inability to crack the brief. It can become a point of contention with the client because they don't want to be spending a lot of extra money on creative time because the creative department is having trouble identifying a solution. However, the timesheet must be filled in correctly to track that time and show the client how the money was spent, and how the agency operated. It's a good way to see if some projects are too labor-intensive to turn a profit, or if others are so lucrative as to merit investment in that client for further work. And in a nutshell, that's the role of the timesheet. Money: Timesheets show an agency (even in-house) how many hours were recorded for each part of every campaign. It's easy then to see if the client's retainer is worth it, or if it's time to put the client on a project-by-project basis. With an in-house agency, that time may not directly lead to billings, but it does show management how effectively they are utilizing the creative department's time. If it is discovered, they are spending 90% of their time on just one aspect of the business, that can create some red flags. Transparency: If timesheets are done correctly, it's easy to see where things are working smoothly, and where bottlenecks or inefficiencies are creeping in. Why is one copywriter spending half the time on one client than another is? And if more creatives are needed, a quick look at the timesheet will see if the department is overworked. Commitment and Accountability: Most clients expect a certain amount of hours to be spent on a project. If they don't believe the right amount of effort was put into a job, the timesheets can provide the data to say otherwise. It's also a way to show some clients just how much value they're getting from the agency. Analysis: Past performance is often a good indicator of the future. If a client is sucking the life out of the agency and making it hell on everyone, the data from timesheets can show if it's worth keeping that client around, or if it's time to let them go. On the other side of the equation, it can show an agency the profitability of some clients, which require minimal creative work and effort, but a maximum return on the investment. Time: Many people in agencies, especially in creative departments, do not want to dedicate any of their time to administration. As a creative, it can be detrimental to break away from a great creative brainstorm to fill in hours. Many account managers have the same problems. It's ironic, but time for timesheets is rarely allocated. Errors: This goes directly to the first point. Many creatives will leave the timesheets until the last minute before the end of month billing report. And that means that the accuracy of a timesheet goes from fairly good to appalling. It's hard to remember how many minutes you spent on one job two weeks ago, so it's often a piece of guesswork. If the timesheets are all guessed, it makes them almost useless. Poor Focus: Time is not a great indicator of excellent advertising. One shop could spend 40 hours and not produce anything of note; another could work 10 and produce a masterpiece. Timesheets do not record the quality of thinking; just the time spent doing it. Timesheets are here to stay, and they must be done manually. Automated time tracking doesn't work, because it requires manual starting and stopping. If you forget to start the clock, you lose hours. Forget to stop it, and some poor client is being billed for hours of work that were spent on another project. That, in turn, could lead to problems (and even lawsuits) with overbilling, and the loss of a valuable client. The only way to guarantee good time tracking is to insist everyone in the agency updates timesheets at least twice a day, once before lunch and then again before going home. If this is done, the timesheets will be accurate and helpful. And if it's not being done, agencies should get creative with motivation. Find a way to incentive the time tracking process. Give those employees who keep a meticulous record of their time a weekly bonus, or a few hours off on Fridays. It may seem like a waste of time and money, but accurate timesheets can be worth far more to the agency than a few hundred bucks here or there each week.